Research confirms that symbolic images are multi-faceted, revealing new aspects of one's Self, and may continue to direct each painter's life for months and years after they appear. Symbols have a life and a direction of their own, and the rational mind must learn to sit back and allow another cognition to function. It is necessary to view the overall evolution of the Authentic Self as a developing process expressed throughout a series of paintings. 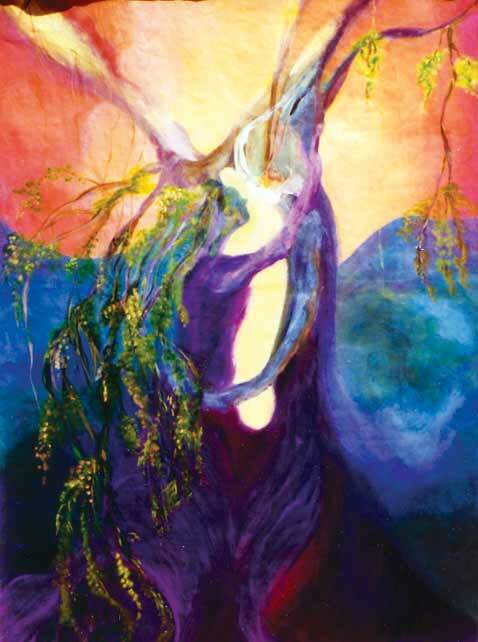 The following three paintings are from Susan Bello's Spontaneous Painting series and they document the developmental process of her Authentic and Higher Self. The 2,000 year old spiritual woman is a mythological figure who lives in my unconscious. The wave of people in blue robes represent a spiritual order from matriarchal times, that serve the Goddess and live in the Himalayas. In the middle section of this painting this tribe submerges into the dimension of space/time and reemerges in the modern world in order to reintroduce the knowledge of healing through Art. The image of the woman holding a staff with the half-moon at the top may represent a priestess from the moon cults during the days of Goddess adoration. The pre-Christian matriarchal societies worshipped the moon as an embodiment of the deep feminine, the inherent instinctual wisdom and the creative and fecund powers of nature. This band of women is returning now to the patriarchal societies in order to implant Spiritual Art once again and integrate the gifts of the unconscious mind with the consciousness of the new millennium. I consider this to be a precognitive painting because 10 years after having painted it, I participated in 1998 in an exhibit of Spiritual Art inside of one of these tall white buildings, the central branch of the Bank Caixa Economica. Most of the female artists who participated felt that they were members of this tribe. I take this to be a potent demonstration of the power of the symbol to realize our profound and deepest desires and other dimensions of consciousness. 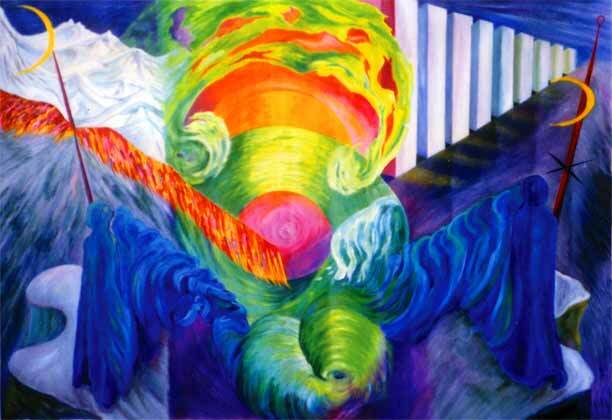 The symbol transcends concepts of linear time and can express past, present and future states of time in a painting. Archetypal art expressed in public murals can awaken uplifting values in social consciousness promoting peace and social change. My spontaneous paintings led me to research if public murals expressing spiritual themes could impact not only individual healing, but social transformation. Rober Zajonc's exposure hypothesis has affirmed that repeated exposure to a stimulus can intensify a person's attitude toward the stimulus and will have an impact on the viewer. I believe that a painting which provokes a deep emotional response registers a subliminal impact, that over time can influence the viewer's opinions and convictions toward the issue portrayed. The search for powerful symbolic images which will plant spiritual ideals relating to peace, respect for nature, and kindness toward one another, are a few such ideas that can be expressed in images. Modern alienation arises from the absence of the sacred in our lives. Living in a society where the way of life is based on manic production and consumption, mindless waste and greed, we need to balance the disequilibrium facing our world culture, and establish a relationship within a larger context of meaning and purpose. I am talking about "re-mythologizing" our consciousness. The search for new powerful symbolic images that will mobilize the collective unconscious is a challenge the eco-artist of today confronts. Artists around the world can be educated to create a new code of powerful social symbols to inspire and guide people. Many people who pass by such art work each day, seeing them on the subways, at bus stops, on billboards, can be educated and influenced by the painting's messages. The visionary artist is a conduit receiving and transmitting new directions to society. This Goddess may be my Higher Self. She sits with a Biblical-like book on her lap. The green man appears as a strong force shooting up from out of the earth, joining her. Who is this man and what does he represent? Psychologist Roberto Assagiolo has identified two stages in psychotherapeutic work: First: a period of "personal synthesis" in which psychological issues are addressed and worked through. Second: a period of "spiritual psychosynthesis" in which there is a process of recentering around a Higher Self as a person disidentifies with their personality and re-identifies with the spiritual center of their being. Albert Einstein explored in his theory of relativity a different way of organizing time and space than our past, present, and future conceptualization of reality. I believe this to be a precognitive painting that awakened a life direction well in advance of its effects being recorded by my conscious awareness. I wondered when I was painting it why I placed, of all things, a book on the Goddess’ lap. The image spontaneously appeared without my conscious mind directing it. Two years after I painted this I began writing the book Painting Your Soul, published in Brazil. At the time I painted this I had no intention to write a book. Altered states of consciousness may express themselves through art-making. The artist may become a creative channel of expression for these spiritual forces emerging in oneself. As well, spontaneous art making is a channel to receive information in a symbolic language from the Universal Mind. It may be that "higher spheres" of consciousness may communicate with us more readily through the creative channel, and one of its languages is that of the painted symbolic image.